In December 2015 ‘Birds of Conservation 4: the population status of birds in the UK, Channel Islands and the Isle of Man’ was published. Commonly known as the ‘BoCC’ this report represents the definitive assessment of the status of the UKs birds. All breeding, wintering and passage populations are assessed using data collected through the UK’s bird monitoring schemes, and measured against a set of objective criteria which leads to them being placed on the Red, Amber or Green Lists. The assessment does not simply look at the numbers of birds present, rather it considers the trends in populations and consequently some species with comparatively small populations in the UK are on the Green List and some species present in large numbers are on the Red List. Since the previous assessment (BoCC 3, published in 2009), three species (Temminck’s Stint, Wryneck and Serin) are no longer considered to have viable UK breeding populations and were therefore not subject to assessment. The addition of Caspian Gull to the list resulted in BoCC 4 considering the status of 244 birds within the UK, compared to 246 in BoCC 3. Of these, 67 are included on the Red List, 96 on the Amber List and 81 on the Green List. This represents an increase in the Red List of 15 species since BoCC 3. However, it wasn’t all bad news, the Green List increased by 14 species. There were no species that went directly from the Red to Green lists, although some species did move in the right direction. 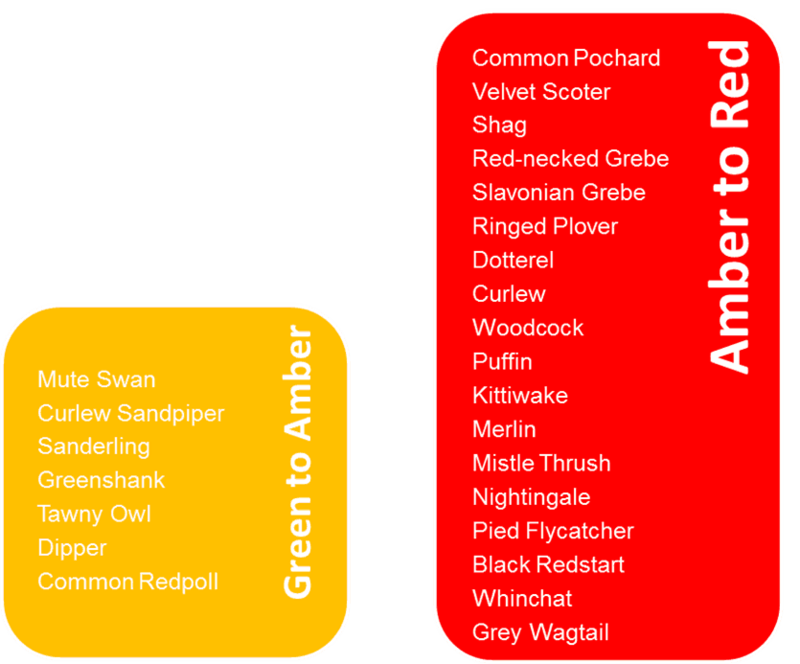 Two species moved from the Red to Amber List (see below), both of which have relatively small populations in the UK, although the populations of both have markedly increased in the last quarter of a century, and one of which is a real conservation success story in the UK. There were also 23 species that moved from the Amber List to the Green List. This summer migrant to the UK is traditionally thought of as a heathland specialist, however, it also breeds within pine plantations, favouring those areas where tree growth is between two and 14 years of age. Between 1972 and 1992, the range of this species in the UK declined by >50% primarily due to habitat loss. In 1992 the population was estimated to be around 3,400 males, increasing to 4,600 males in 2004, and it is thoug ht that the population has continued to increase in both number and range. f suitable habitat within commercial forestry and climate change resulting in a general northerly shift in the breeding range. The RSPB have recently released the results of their 2015 Bittern monitoring. In the UK, widespread declines led to the extinction of the Bittern around 1885. The species returned to Norfolk in 1900 and was subsequently proved to breed here in 1911. Having reached a peak of about 80 booming males in the 1950s, numbers again began to fall, and despite a slow recovery during the 1990s, reached a low point of just 11 booming males in 1997. Since then, thanks largely to considerable conservation efforts, the numbers have steadily increased. 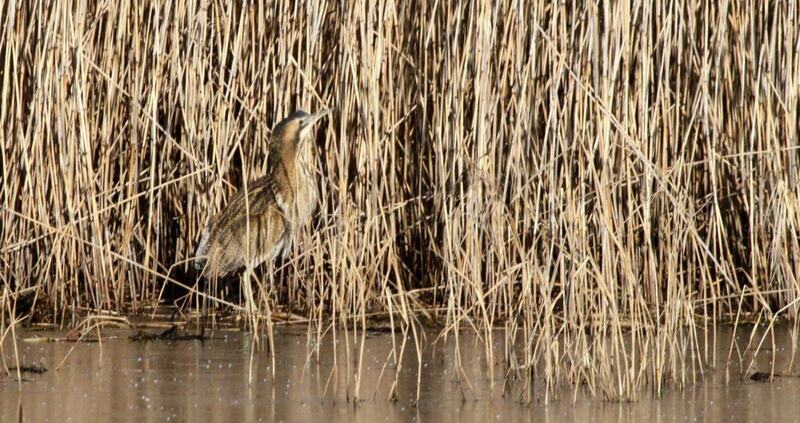 In 2015 a maximum of 156 booming Bitterns were logged at 71 sites (including at new sites in the Fens, Midlands, Norfolk Broads, and also in Wales for the first time in many years), this compares to 141 males at 62 sites in 2014. BoCC 4 moved seven species from the Green to Amber Lists, with a further eighteen species upgraded from the Amber to Red List. But, of most concern are two species that were transferred directly from the Green List to Red due to worrying recent declines; White-fronted Goose, on account of declines in the non-breeding population, and Long-tailed Duck, as a consequence of it now being classified as Globally Threatened by Birdlife International. There are two races of White-fronted Geese that occur in the UK; Greenland White-fronted Goose and European White-fronted Goose. In the UK, European White-fronted Goose winter mainly in the south and east of England although in recent winters records of this subspecies have occurred as far north as Orkney. The birds that winter in Britain are from the Baltic/North Sea population which breed in European Arctic Russia and northwest Siberia and winter predominately in Belgium, the Netherlands and Luxembourg. Britain is on the western edge of the population’s wintering range. The current estimated British population of this sub-species is 2,400 birds, which reduced by 26% between 2001/02 and 2011/12. This sub-species is threatened by intense hunting pressure resulting in mortality at moulting sites. It is also susceptible to poisoning by pesticides used on agricultural land. The UK together with Ireland supports the entire global population of Greenland White-fronted Geese during the winter months, with these birds spilt around equally between Ireland and Great Britain. A survey completed in spring 2015 suggested the lowest numbers in Great Britain for 30 years comprising just 18,854 birds, a worrying reduction of 9.3% in comparison to the previous spring. A large proportion (7,984 birds) of the UK population resides on the Wexford Slobs during spring, with a further 2,282 birds in the remainder of Ireland. The Hebridean island of Islay hosts 3,995 birds with the rest of Britain supporting a further 4,593 birds, predominantly in western Scotland. The population reduction between 2014 and 2015 was primarily a consequence of the loss of 1,000 birds from the Islay population (with a decline of 60% over 15 years) and 500 from elsewhere in Britain. Due to the size and consequent importance of the Islay population it has been subject to recent studies to assess the reduction in numbers. Scottish Natural Heritage and the Wildfowl and Wetlands Trust are partway through a research project to try and better understand this species winter ecology by tracking movements using numbered neck-collars and GPS tags. Although the dataset is currently small it is thought that survival is low, which combined with consistently poor reproduction success since 1999 has resulted in the alarming decline. It is also thought possible that the habitats on Islay may no longer be able to support the numbers of Greenland White-fronted Geese that they once did, potentially through competition with Barnacle Geese. It has even been suggested that when numbers of breeding females are compared, Greenland White-fronted Geese are more rare globally than Giant Pandas! Given the rate of decline, it is a shocking fact that this species can still be legally shot in Wales, where just 19 birds resided in winter 2015/16. The RSPB are currently lobbying for the ban on shooting this species in Wales; you can provide your support here. This species is now included on an increasing and worryingly long list of species that occur in the UK that are considered by Birdlife International to be ‘Globally Threatened’. The only species in this category in BoCC 3 were Balearic Shearwater and Aquatic Warbler, although BoCC 4 saw the addition of Common Pochard, Velvet Scoter, Slavonian Grebe, Puffin and Turtle Dove. 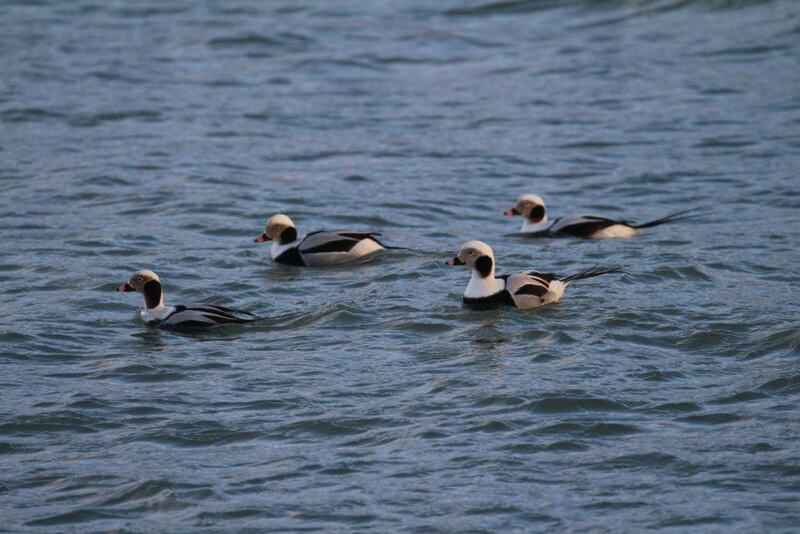 The current global population of Long-tailed Duck is estimated to be between 6,200,000 and 6,800,000 birds. A significant decline, which was first noted in the early 1990s, has been detected in the wintering population in the Baltic Sea. The population in this area was estimated at 4,272,000 birds in 1992/93, by 2007/08 it was thought to have reduced to approximately 1,486.000, a staggering decrease in around 25 years of 65%. There is currently much uncertainty regarding trends within the smaller populations in Europe away from the Baltic. The cause of decline is not well understood although this species is thought to be threatened by wetland habitat degradation, wetland drainage and peat-extraction. Oil pollution and entanglement with fishing equipment are also likely to be contributory factors. Surveys in the Baltic suggest that a very low proportion of juveniles are present, indicating low reproductive success on its Arctic breeding grounds. The breeding success of this (and other) species appears to have declined since the mid-1990s, when the formerly distinctive three to four year cycle in the abundance of Arctic rodents collapsed, possibly due to climate change. With fewer rodents around, Arctic predators are now thought to have an increased impact on breeding birds every year, instead of only once every three to four years. The accurate assessment of trends in species relies heavily on the collection of survey data by volunteers; you can contribute by collecting survey data that feeds into this assessment. For more information on surveys in your area contact your local British Trust for Ornithology representative.